This article was originally published as a blog entry where you can access more posts about this exchange. In many ways, los reuniones de gestión resemble collective meetings at the Olympia Food Co-op: they are gatherings of the whole collective that happen in three different groups, during which collective members make decisions about everything from how to speed up the lines at the registers to whether or not to start a new education program to better fulfill their mission. In other ways, the reuniones are very different. Here at CECOSESOLA there is no agenda, for example, and no designated facilitator. Meetings last as long as they need to: sometimes 2 hours, sometimes 7, and the ferias are closed while people meet. In addition, workers from CECOSESOLA’s affiliated co-ops are invited to attend meetings, and can bring up any concerns they may have from the point of view of production, etc. Additional reuniones de gestion are held weekly for new collective members, where they learn about the history and practices of CECOSESOLA as an organization and are invited to do their own research about the history of the cooperative movement and present what they’ve learned. Another way CECOSESOLA’s reuniones are distinct from OFC’s is simple: size. Dividing CECOSESOLA’s approximately 580 workers into three groups still equals a heck of a lot of people. This is the primary thing wreaking havoc with mine and Ale’s nerves. We practice our short speech, Ale from notes, me from the miniature essay I’ve written with the help of the monstrous verb book and dictionary I thank my lucky stars I lugged here every day. It’s not incredibly late, but we are exhausted from two days straight of absorbing new information. We mumble through what we’ve planned and head off to bed. A little after 7 in the morning, people begin to arrive at the escuela, the site of the meeting and of the dormitorio where we’ve been staying. A particularity of this coop in comparison with every other I’ve experienced is that people tend to arrive not only on time but early. By the time Ale and I head outside a few minutes before 8:00 (late, or so it seems) there are more than 150 people already gathered in a circle several rows deep on the shaded patio outside the escuela. The meeting begins with news from one of the producer co-ops and moves to a discussion about the impact on the stores when many workers leave together for breakfast. Decision making is discussed, and the effect boards of directors have on the collective process. Strong coffee is passed around along with sugar buns and a hard pastry that looks like a horseshoe. At times the low murmur of a hundred people listening and reacting to each other swells to a rumble, and the group is called back to attention by means of hand claps and piercing whistles. By the time Ale and I and several students from Evergreen, most of whom are working in CECOSESOLA affiliates, are set to introduce ourselves, some of my nerves have settled because I’m so interested in what’s being said. Our presentation goes smoothly. 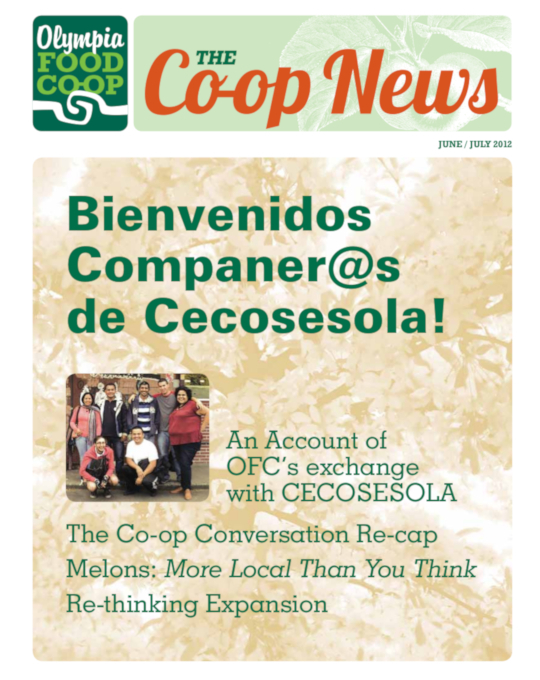 The compañer@s welcome us with warmth and ask thoughtful questions about the Olympia Food Co-op’s involvement in the community and the relationship of our low income membership to the economic crisis in the U.S. I think about the ways I see confianza at Olympia Food Co-op – like the fact that I know that if worst came to worst my coworkers and I would do anything for each other – and I think of the ways I think our confianza needs to grow. One of the main themes Ale and I are here to investigate through our exchange with CECOSESOLA is how consensus based decision making works on such a large scale. At times we feel so stretched to come to consensus at Olympia Food Co-op, and we often think it’s because of our size. And indeed, how could it not be difficult for 76 people to agree on the best way forward in a given situation, when it can be exhausting just figuring out with a group of friends where to have lunch? What is obvious to us almost as soon as we arrive, and certainly by the end of this first meeting, is that confianza is a huge part of what makes consensus decision making possible at CECOSESOLA. With 580 people, it’s crucial that each compañer@ be able to trust the other, that each have a deep respect for the others’ opinion, and that each have as complete a picture as possible of what it means to think in terms of the good of the whole.